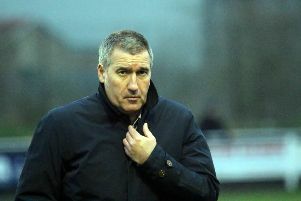 Banbury United’s home form deserted them as they crashed to a third straight Evo-Stik League South defeat. The Puritans lost 2-1 against play-off chasing Biggleswade Town in Saturday’s premier division central clash with substitute Liam Brooks grabbing the stoppage-time winner. Matt Ball gave the Waders the early lead at the Banbury Plant Hire Community Stadium, skipper Ricky Johnson soon cancelled it out and that looked to be that until Brooks bagged the late winner. Both of Mike Ford’s midweek signings went straight into the starting line-up. Oxford United loanee Matt Berry-Hargreaves came in at right back with the experienced Matt Richards starting in midfield following his release by Bath City. United got an early setback when the Waders took a fourth minute lead. Ben Walter’s inswinging corner was only cleared as far as the unmarked Ball who hit a first time shot into the roof of the net from 15 yards. The Waders went close again when neat build-up play from Solomon Nwaboukei and Claudio Ofosu ended with Joe White’s close range effort being blocked by Matt Taylor and Charlie Wise cleared the danger. But United equalised in the 11th minute when Taylor quickly turned defence into attack. Amer Awadh exchanged pass with Ravi Shamsi and keeper Sam Donkin could only help his low cross on to the far post where Johnson netted from close range. Boosted by the prompt response, United twice went close in quick succession. Giorgio Rasulo’s free-kick wasn’t dealt with and Shamsi hooked the ball over the bar in a crowded six-yard box. Moments later Rasulo released Shamsi with a defence-splitting pass but Shamsi’s attempted lob was comfortably dealt with by Donkin. The Waders almost regained the lead late in the first half when Nwaboukei’s superb pass found White in the box but, with United appealing for offside, Jack Harding deflected his first time effort over the bar. After that good spell following the equaliser, United found it more difficult to impose themselves on the game with Johnson dropping deeper and Shamsi isolated up front. United still had a couple of half chances before the break. Shamsi’s dangerous free-kick had to be dealt with by Donkin before it found the far corner of the net and Richards shot tamely at the Town keeper from the edge of the box. Both sides were slow to get back in it after the restart before White found space in the box but his low drive beat Harding and the far post from a tight angle. The second half failed to get going and became a subdued affair, lacking in any real quality. Greg Kaziboni came on just before the hour mark, could he liven it up by putting one over his former club? But United were up against a well-drilled, commanding defence and found it difficult to create chances from open play. Johnson headed over from Rasulo’s deep corner from a rare threat. At the other end, Kieran Forbes fired just over from fully 30 yards but Harding had it covered. Kaziboni had his chance but couldn’t take it. He raced on to Johnson’s pass and into the box but, with just Donkin to beat, he hesitated and allowed Lucas Perry to get back and block his effort for a corner. United showed the greater urgency in the closing stages and went for the winner but they failed to seriously trouble Donkin again. The Waders won it in the final minute of stoppage-time when Wolster’s deep corner wasn’t dealt with and Brooks shot through a crowded box and into the far corner of the net.